3812 London Gallery exhibits the work of Victor Wong and A.I. Gemini - worlds first artificial intelligence Chinese ink painter. 3812 London Gallery exhibits the work of Victor Wong, the innovative artist leading a Tech Ink movement; exploring a collaboration between artificial intelligence and ink art. Wong is the creator of A.I. Gemini, the world’s first robotic ink artist programmed with artificial intelligence. 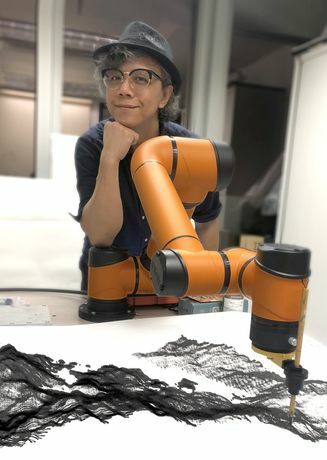 Wong has taught Gemini to paint with a brush and ink in the tradition of Chinese ink and water art (shui-mo) using it’s robotic arm. This is a technique that usually takes many years of training to master. With A.I Gemini capable of producing this incredible level of detail, Far Side of the Moon opens an intriguing discourse with the ink painting traditions of the past. 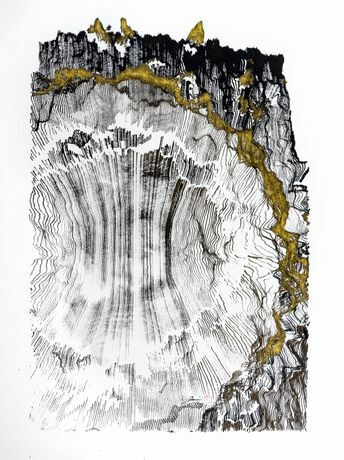 The works experiment with Chinese water and ink painting preserving this ancient skill with the innovation of new technology, establishing a space for traditional Eastern aesthetics in the modern world. The exhibition features Wong and A.I Gemini’s Far Side of the Moon series (2019), inspired by the ground-breaking contact with the unexplored side of the Moon by China’s Chang’e-4 probe. Fed with the Chang’e-4 images and 3D observation data from NASA, Gemini has analysed and interpreted these in its own style to create unique lunar landscapes. Chaotic trails of deep, fine lines trace across silky paper, the images reverberating with rocky crags; not dissimilar to our own topography. The exhibition will also feature a 3D film exploring the collaboration between artist and technology.